KATHMANDU, Feb 10: The number of group trekkers increased by around 63 percent in the first eight months of 2017 compared to the same period of 2016. Figures from the Trekking Agencies Association of Nepal (TAAN) till August 2017 show that the number of group trekkers who took Trekker’s Information Management System (TIMS) cards went up by 63.28 percent compared to the same period of 2016. According to the data compiled by TAAN, a total of 80,845 group trekkers received group TIMS cards till August last year. During the same period of 2016, only 49,513 group trekkers had received TIMS from TAAN. TAAN distributes TIMS cards to trekkers traveling in group while Nepal Tourism Board (NTB) issues TIMS cards to free individual trekkers (FIT). According to NTB a total 24,956 FIT trekkers visited Nepal in the first eight months of 2017. Of which, 2,951 are South Asian nationals while 22,005 are from other countries. Tourism industry of the country has unexpectedly bounced back in 2017 after the devastating earthquake in 2015 and subsequent unofficial blockade of India. Along with increased arrival of tourists, tourism-related activities also increased in 2017. According to the Department of Immigration, Nepal welcomed 940,000 visitors in 2017, which was higher by 28 percent compared with the previous year. “Group trekkers certainly bring more foreign currency into the country and we need such tourists that spend more,” Dahal said. The increase in the number of trekkers was due to the efforts of both private sectors and government, Dahal said, adding that the number of tourist arrivals was still below the expectation of tourism entrepreneurs. 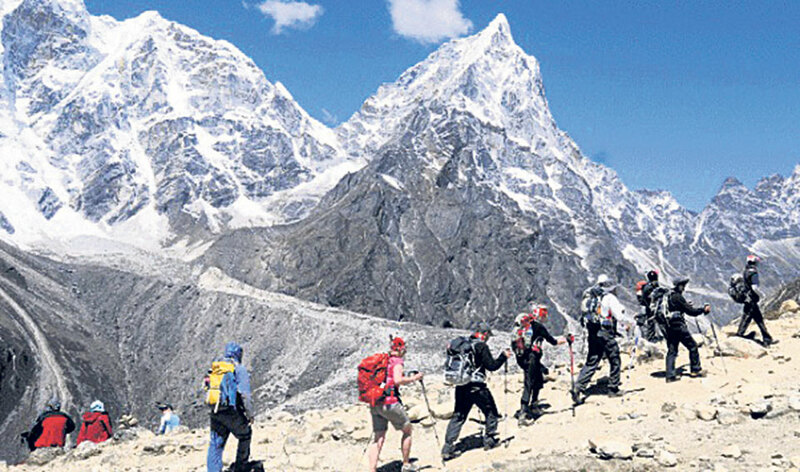 One of the measures that Nepal’s trekking entrepreneurs have been seeking is the policy of compulsorily requiring a guide for each trekker, which would make this sector more organized and safer.